Home Obituaries Van Byron Harris Sr.
Van Byron Harris, Sr., 80, of Splendora, Texas took his final ride Saturday, June 2, 2018, in Kingwood, Texas. He was born on Sunday, May 1, 1938 in Houston, Texas to Byron Martin and Willie Sue (Acree) Harris, both of whom have preceded him in death. Van was preceded in death by his trail partner and loving wife of 58 years, Rochelle (Shelly) Harris. Left to cherish his memory are his loving children, Deborah Gardner and husband Gary, Vanessa Duncan and husband Larry, Deitra Inkster and fiance Mark Johnson, Van Harris, Jr. and wife Holly; grandchildren, Grant Gardner and wife Nichole, Shelley Petty and husband Justin, Kelly Jake Duncan and Shelly Sanchez Terrell, Patrick Duncan and wife Amy, Holly Vines and husband Tommy, Alisha Ford and husband Bryan, Lane Harris, Jennifer Weaver and husband James, and Cody Inkster; 15 great-grandchildren; along with numerous other loving family and treasured friends. Visitation for Van will be held at Neal Funeral Home on Tuesday, June 5, 2018 from 6 pm to 8 pm. 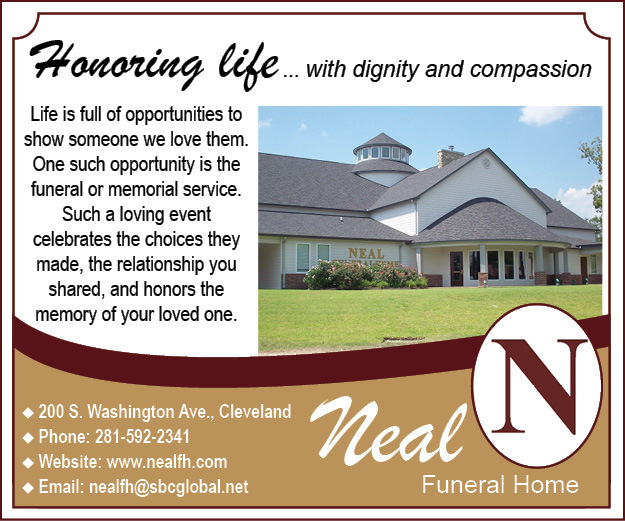 Funeral services will be held at Neal Funeral Home on Wednesday, June 6, 2018 at 6 pm. This cowboy will be laid to rest at Morgan Cemetery at sunset. Brother Heath Lucas officiating.